Coal bed methane is a natural gas located in coal seams, which is extracted without mining of coal. Coal bed methane is adsorbed on the surface of coal particles, in dissolved coal substance, as well as in closed and open channels and pores. The average content of methane depends on the grade of coal. The average quantity of methane content varies from 8-10 m3 per tonne in gas coal to 30-40 m3 per tonne in anthracite and rapidly decreases to minimal values of 0.3-0.5 m3 per tonne in superanthracite. Gas content in coal depends on the depth of the coal layers, the degree of coal metamorphism, conditions of occurrence (structure) and many other factors. Methane has a global warming potential equal to 21 and contributes significantly to the greenhouse effect. Another negative characteristic of methane is the ability to form the explosive mixture with oxygen, which could be very dangerous. Eventually the problem of coal seam degasation has three aspects: mining methane as unconventional gas, safety of mining operations and reducing methane emissions. The coal bed methane started to be considered as an unconventional energy source since the 1970-s. World reserves of coal bed methane are estimated at 260 trillion cubic meters and are greater than traditional natural gas reserves. The largest resources of coal bed methane are concentrated in China, Russia, Australia, South Africa, India, Poland, Germany, the UK and Ukraine. The greatest development of the extraction of coal bed methane was reached by the United States. The major part of coal bed methane in U. S. is extracted using well intensification technologies including hydraulic fracturing method. 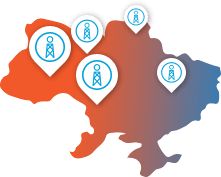 Main sources of coal seams methane in Ukraine are located in Donetsk and Lviv-Volyn coal basins. Total forecasted reserves of coal seams methane in Ukraine constitute to 12-13 trillion cubic meters, out of which 3-3,5 trillion cubic meters constitute to recoverable coal bed methane resources.